Pause in the middle of Falkland Square, level with the turning into Kingland Crescent, and you are probably standing on the line of Poole’s long-vanished medieval defences. Cutting across this area four hundred years ago was a ditch stretching from Holes Bay in the west to Parkstone Bay in the east, backed by the town walls. To the west near the site of the present railway station was the only landward entrance to the town, the ‘embattled gate of stone’ known as the towngate, reached by a drawbridge. There is no record of the process of constructing the defences but it must have been a major operation. The chosen line of the wall and ditch took advantage of the geography of the town, cutting across the narrow neck of land joining the Poole peninsular to the main land. Elsewhere the town was protected by the sea and mudflats. Why the towngate was built to the west rather than near the middle of the defences is not clear. Perhaps it was a case of choosing the highest and most solid piece of ground, but its location required the building of an access road from High Street known as Towngate Lane (later Towngate Street). There are several images of the towngate on old maps, showing it as a square castellated gate house flanked by two round towers. There are also many references to it in the archives, as for instance in the town accounts of 1524 when the two new posts and nearly 2 cwt of iron were needed to repair the gate or in 1645 when workmen were paid for mending the chain of the drawbridge. In contrast, the walls are only sketchily depicted and seldom mentioned in the records. The earliest image comes from a map or bird’s eye view of the Dorset coast dating from 1539 when Henry VIII was planning a series of forts and beacons against attack from the continent (one of which was the blockhouse on Brownsea Island). Confusingly to our eyes, south is shown at the top of the map and an added complication is that some of the depicted fortifications were never actually built. The Poole section shows the towngate with what might be a stretch of wall to the west and a cluster of buildings behind to represent the town. Two circular gun platforms are also shown, one on the Quay and one at the end of the Hamworthy peninsular. We know from the records that a gun platform was built on the quay in 1524, decorated with carved and painted heraldic animals from the royal coat of arms. This platform or its successor may be the one shown on the map, but as space was tight on the Quay it would have probably been removed as soon as the invasion threat was over. The Hamworthy fortification was known as the bulwark and is mentioned in the archives into the 1600s. 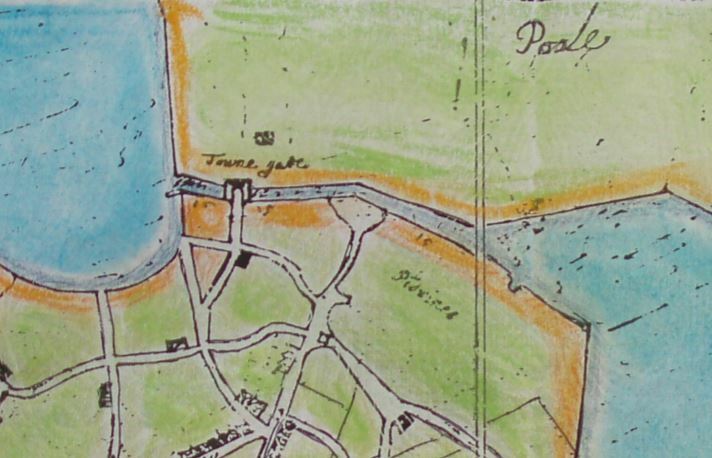 Shortly after the map was drawn up, the antiquary John Leland visited Poole and observed its layout. 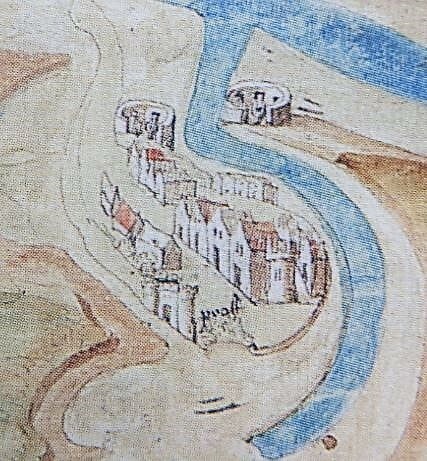 He described the town being connected to the main land ‘by the space almost of a flite shot’ and mentioned the towngate and the ditch, but not the walls at the north end of town. Instead he claimed that ‘King Richard III began a pece of a Toun Waulle at one end of the Kay; and promised large thinges to the Town of Pole.’ This may refer to a section of wall behind the buildings on Thames Street which still exists. Dating from the late 15th century or the 16th century (depending on which authority you consult) this wall of coursed limestone rubble is about 3m high, 30m long and in places nearly 1m thick. It contains an arched doorway and for part of its length, a projecting castellated top supported by corbels. On the inside are stone steps leading up to a parapet. Whether this was a town wall or a rather over-sized property boundary and whether it was originally longer and was ever finished are among the many questions surrounding the structure. What is clear is that at one time the shingle came up to foot of the wall but over time the shore was reclaimed, leaving the wall high and (literally) dry. By 1609, an inventory of a house on Thames Street describes its two gardens, one within and one outside ‘the battled wall’. In other words, by this date the wall had lost its function as a property boundary, let alone anything as grand as a town wall. 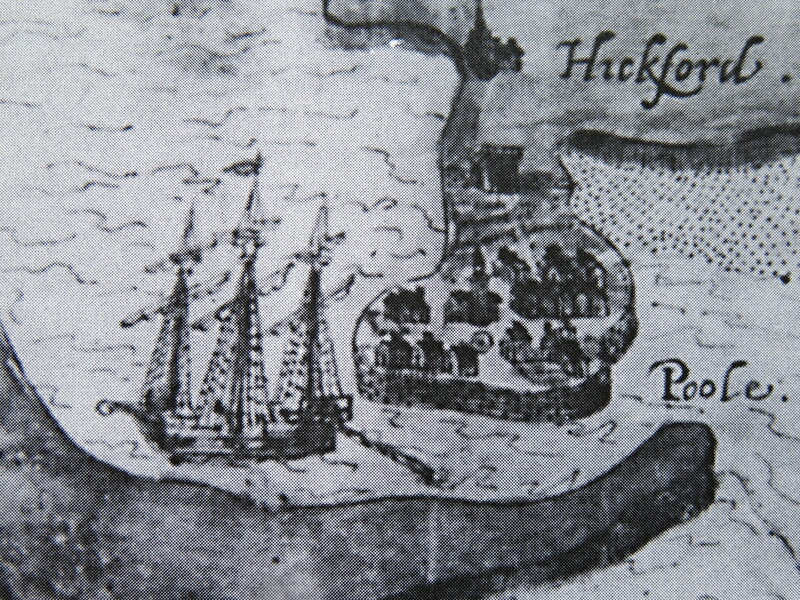 In 1582, a legal settlement with the town’s brewers over taxes made a rare reference to the town walls, describing how Poole’s revenues ‘must of necessity be from time to time employed used and bestowed upon the necessary provision and maintenance of the said town the church the haven the quay the walls and other necessary offices . . .’ Around the same time another map of the harbour seems to show the town completely walled around, with a structure, presumably the towngate, at the northern end of town. The details cannot be taken literally, but the map-maker clearly wanted to show a fortified town. 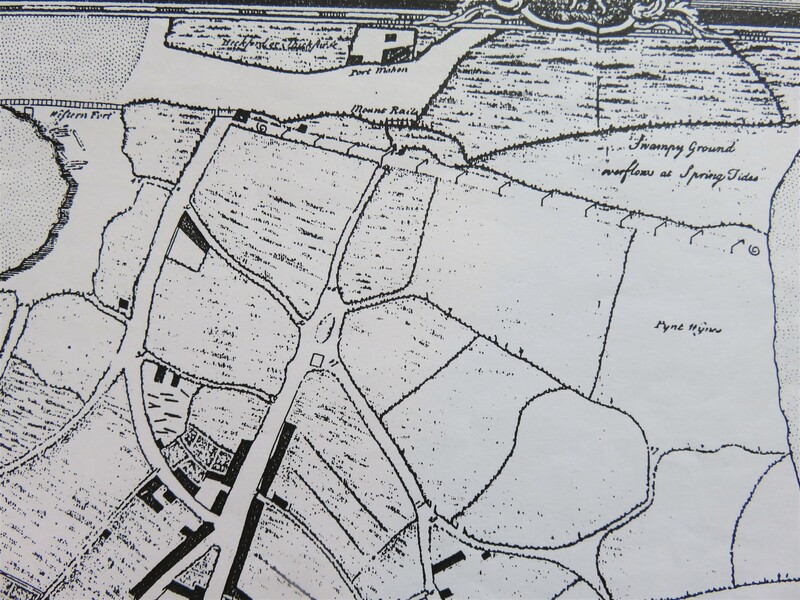 It is not until the early 17th century that maps begin to show the layout of the town with some accuracy for the first time and it is from these that we get most information about the defences and their location. By the time of the outbreak of the Civil War in 1642, Poole’s defences like those of many towns must have seemed like a relic from the past. In changed times, however, they were about to come into their own. Poole had declared its support for Parliament and one of the first actions of the authorities was to make an order that ‘that a constant watch shalbe from henceforth kept for the preservation and the Defence of this towne, by the number of one watch man, one Rounder, and a gunner for the daye tyme att the towne gate, and six ordinary watchmen of the Comonalty, and two rounders for the night watch’. The inclusion of ‘rounders’ or roundsmen suggests a boundary which could be patrolled. The following year, there was an attempt by the Royalists to take the town by treachery which casts more light on the war time defences. A Royalist Captain Thomas Phillips had been having secret meetings with Captain Francis Sydenham of the Poole garrison to persuade him to betray the town into Royalist hands. Sydenham pretended to accept but revealed the plot to Col. John Bingham, the Governor of Poole. Sydenham as officer of the watch was to blow a horn as a signal and then rush into the town, leaving the gates open for the Royalist troops to enter. On the chosen night the Royalists about 500 strong under the command of the Earl of Crawford approached the town in the darkness and hearing the signal, charged forward only to find the gate closed against them. Worse ‘before the gate was a halfe-moon, at the entrance of which there were chaines to be drawne up at pleasure; the earle with his horse filling the halfe-moon, the chaines were then drawn up, and the muskets and ordnance . . . gave fire upon those that came on, which caused all that were not slaine to throwe downe their armes and runne away.’ The earl barely escaped with his life and the Royalists lost valuable arms and about 50 horses, beside those killed, injured or taken prisoner. Half moons were outworks, usually with two sides coming to a point and short flanks, used as a refuge for defenders outside the main fortifications or to protect a vulnerable spot such as a road or the entrance to a town. Where exactly the Poole half moon was and how it operated, we don’t know but it certainly served its purpose on this occasion. The following year, the town was again under attack when the Royalist Sir Thomas Aston defeated a detachment of Poole horse and chased them to the edge of town ‘where the Rebels’ cannon and small shot played thick upon him from the walls’, according to the Royalist newspaper, Mercurius Aulicus. There is evidence from the archives for other fortifications used during the Civil War. One was a fort at Hamworthy said to be built from stone taken from the Hamworthy church. It was probably designed to prevent attackers coming down the peninsular and getting too close to the town. In 1645-6 the town accounts mention payments to 4 workmen ‘to unrig the fort at Ham for lading it, bringinge it out & pillinge it & for the cartinge of it all’. It was not entirely demolished because in November 1646, Thomas Smedmore of Hamworthy was awarded compensation of £12 a year for his ‘great losses by fortifications which were made upon his ground’, making it clear that these were still standing. Other defensive structures mentioned in the same accounts about which very little is known are ‘seaman’s battery’ and the ‘western works’, although the latter may be the same as the ‘western fort’ shown on a map of 100 years later near the western end of the ditch. After the Civil War some of the defences like the half moon were probably removed fairly quickly while other structures gradually fell into disuse. 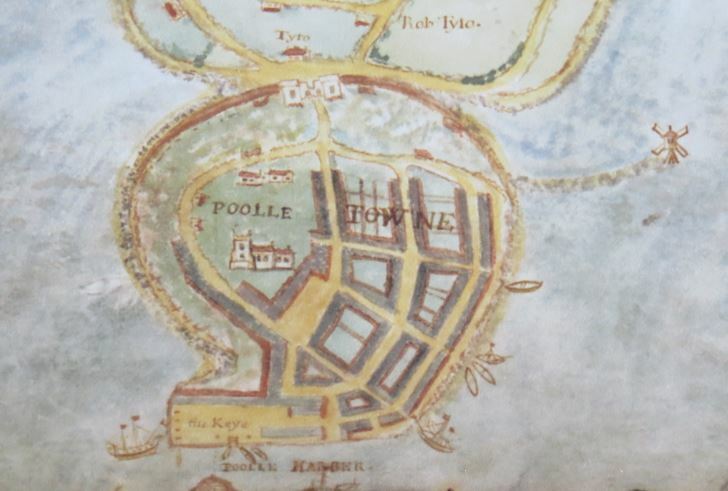 In August 1653, the Council of State ordered towns to demolish their fortifications and ‘the town of Poole, Ham and all the works adjoining, to be immediately dismantled’. So the walls and the towngate were taken down after 200 years’ existence and the ditch was filled in or gradually silted up. In 1745, at the time of the second Jacobite rebellion, an attempt was made to re-excavate the ditch but this was discontinued after the town had spent around £300, according to the traveller Dr. Pococke. The defences had gone but their ghostly imprint on the streets of Poole remained. Towngate Street continued as the main road leading out of town and 100 years after the wall and ditch had gone, High Street still came to a stop at the northern end with a ropeworks built across it. 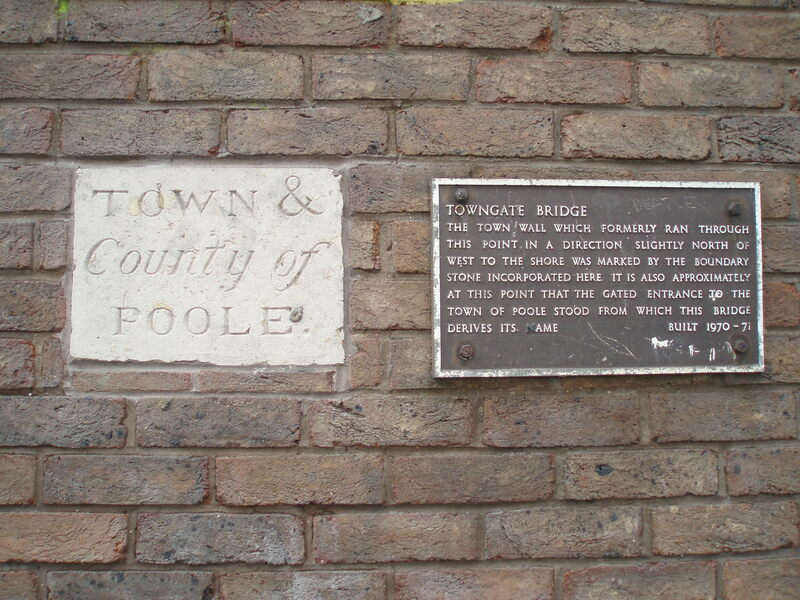 When the turnpike trust was set up, the Poole tollgate was built on the site of the old towngate where it remained for another 40 years. It was not until the 1830’s that High Street was extended into Longfleet and the toll gate was relocated there. The coming of the railway in 1874 reinstated a barrier more or less along the same line as the old defences, which remains today. Over the years, reminders of the lost defences have unexpectedly surfaced. In 1835, workmen digging a well near the site of the wall found a skeleton with long hair still attached. Whether this was a victim of the Civil War or some other unfortunate individual, we don’t know. In the 20th century, shaped blocks were found in a garden in Rigler Road, Hamworthy, perhaps the foundations of the fort. In the early 1970s it was still possible to race the old boundary line from Holes Bay in the west via the site of the gate at Towngate Street to the reclaimed area north of Pitwines. Later developments would sweep away most landmarks in the area. 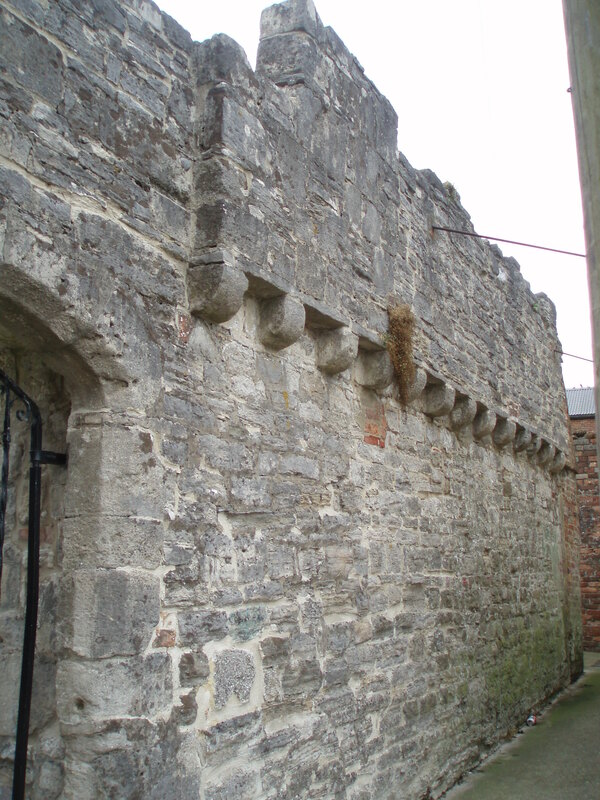 When the Towngate Bridge was being built in 1971, traces of the old town wall were discovered and some of the stonework was taken to Scaplen’s Court for display. An old boundary stone was also found nearby and mounted on one of the bridge supports with a modern explanatory plaque. At least the name of the bridge preserves the memory of the old towngate and as we sweep over the bridge today we can imagine the deadly fight in the darkness nearly four centuries ago when the townsmen fought off the Royalist ambush. Main sources: ‘An Old Town Boundary’ Poole Corporation Report 1970 pp. 97-9 / ‘The History of the Borough and County of the Town of Poole’ H. P. Smith / ‘History of the Town and County of Poole’ John Sydenham. This entry was posted in Events, Places, Social history, War by poolemuseumsociety. Bookmark the permalink. Do you happen to have an image of the whole map that could be shared? I am looking for information about the beacon that was erected near Lulworth Cove on the eastern cliff. John Sparrow included the beacon in a cartouche circa 1771. I had heard of this map at the British Museum, and would love to see it. Thanking you in advance for your kind reply.